Among the most notable sax players of rock’s earliest days, a sessionist at heart who found himself thrust in the spotlight momentarily before receding back into the shadows, but who left behind some of the defining performances of the late 1940’s and early 50’s rock scene. Chamblee was born in 1920 in Atlanta, Georgia but moved to Chicago as a boy where he grew up with Ruth Jones who’d go on to an even more legendary musical career of her own under the name Dinah Washington. After attending law school Chamblee joined the Army during World War Two where he came into his own musically, playing in Army bands throughout the duration of the war. Upon his release he got a job as a session musician for Miracle Records where he was called upon to back a wide array of artists in various styles. He cut a few sides as leader and then was drafted into working alongside pianist Sonny Thompson, another Miracle session musician, on what turned out to be the biggest hit the label ever issued and the biggest rock hit of 1948, Long Gone (Part Two). 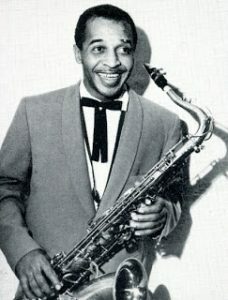 Chamblee’s saxophone helped establish the instrument as a centerpiece of rock ‘n’ roll and he recorded a follow-up with Thompson that also hit #1 on the race charts in 1948. The two would continue to record together and would score another hit along the way but Chamblee now was able to put together his own band to cut records under his own name and his hot streak continued with a Top Ten hit in 1949. As Miracle Records floundered over the next few years Chamblee cut sides for other labels while returning to session work where he contributed to another #1 record by The Four Blazes. But the more flamboyant sax styles that were now in vogue ran counter to his own strengths and he found himself returning to his jazz roots, first playing with Lionel Hampton for two years in the mid-50’s and then not only playing alongside childhood friend Dinah Washington, but marrying her (he was her fifth husband), recording duets with her and then after they divorced he came back to lead her band for awhile. He recorded some jazz sides under his own name and in later years reunited with another former Miracle Records star, bluesman Memphis Slim, for a pair of albums before eventually settling in the New York Club scene where he was a venerated presence. Chamblee died in 1999 at the age of 79, a working musician for his entire adult life and a rock ‘n’ roll star for two heady years along the way. As sideman… behind Sonny Thompson.